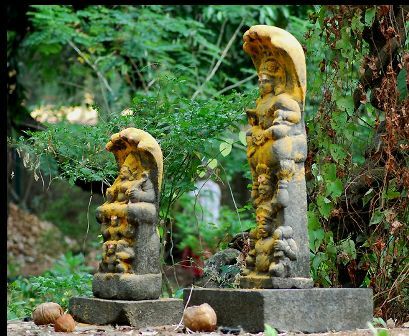 A Hoysala sculpture of a Naga couple. 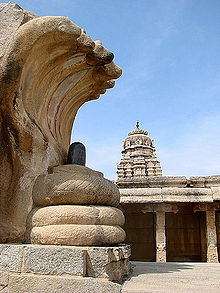 Halebidu. Nāga (Sanskrit: नाग, IAST: nāgá, Burmese: နဂါး, ngar, Indonesian: naga, Javanese: någå, Khmer: នាគ neak, Thai: นาค nak, Chinese: 那伽) is the Sanskrit and Pāli word for a deity or class of entity or being, taking the form of a very great snake—specifically the King Cobra, found in Hinduism and Buddhism. The use of the term nāga is often ambiguous, as the word may also refer, in similar contexts, to one of several human tribes known as or nicknamed “Nāgas”; to elephants; and to ordinary snakes, particularly the King Cobra and the Indian Cobra, the latter of which is still called nāg in Hindi and other languages of India. A female nāga is a nāgīn or nāginī. 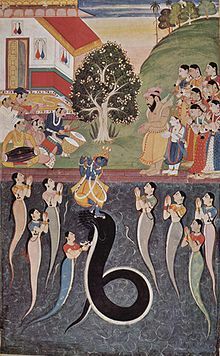 In Sanskrit, a nāgá (नाग) is a cobra, a specific type of snake (hooded snake). A synonym for nāgá is phaṇin (फणिन्). There are several words for “snake” in general, and one of the very commonly used ones is sarpá (सर्प). Sometimes the word nāgá is also used generically to mean “snake”. The word is cognate with English ‘snake’, Germanic: *snēk-a-, Proto-IE: *(s)nēg-o-. In the great epic Mahabharata, the depiction of Nagas tends toward the negative, and they are portrayed as the deserving victims of the snake sacrifice and of predation by the eagle-king Garuda. The epic calls them “persecutors of all creatures”, and tells us “the snakes were of virulent poison, great prowess and excess of strength, and ever bent on biting other creatures” (Book I: Adi Parva, Section 20). At the same time, nagas are important players in many of the events narrated in the epic, frequently no more evil nor deceitful than the other protagonists, and sometimes on the side of good. Kadru, the ancestral mother of snakes, made a bet with her sister Vinata, the stakes being that the loser would be enslaved to the winner. Eager to secure victory, Kadru requested the cooperation of her offspring in order to fix the bet so that Kadru would win. When her offspring balked at the request, Kadru grew angry and cursed them to die a fiery death in the snake-sacrifice of King Janamejaya, the son of Parikshit, who was the son of Abhimanyu the son of Arjuna. The king of the snakes Vasuki was aware of the curse, and knew that his brethren would need a hero to rescue them from it. He approached the renowned ascetic Jaratkaru with a proposal of marriage to a snake-goddess, Manasa, Vasuki’s own sister. Out of the union of the ascetic and the snake-maiden was born “a son of the splendor of a celestial child.” This son was named Astika, and he was to be the savior of the snakes. Compare with Tiamat and Apsu. Stories involving the nāgas are still very much a part of contemporary cultural traditions in predominantly Hindu regions of Asia (India, Nepal, and the island of Bali). In India, nāgas are considered nature spirits and the protectors of springs, wells and rivers. They bring rain, and thus fertility, but are also thought to bring disasters such as floods and drought. According to traditions nāgas are only malevolent to humans when they have been mistreated. They are susceptible to mankind’s disrespectful actions in relation to the environment. They are also associated with waters—rivers, lakes, seas, and wells—and are generally regarded as guardians of treasure. According to Beer (1999),[page needed] Naga and cintamani are often depicted together and associated directly in the literature. They are objects of great reverence in some parts of southern India where it is believed that they bring fertility and prosperity to their venerators. Expensive and grand rituals like Nagamandala are conducted in their honor (see Nagaradhane). In India, certain communities called Nagavanshi consider themselves descendants of Nagas. 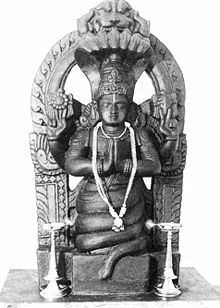 Varuna, the Vedic god of storms, is viewed as the King of the nāgas. Nāgas live in Pātāla, the seventh of the “nether” dimensions or realms. They are children of Kashyapa and Kadru. Among the prominent nāgas of Hinduism are Manasa, Shesha or Sesa, and Vasuki. The nāgas also carry the elixir of life and immortality. Garuda once brought it to them and put a cup with elixir on the ground but it was taken away by Indra. However, few drops remained on the grass. The nāgas licked up the drops, but in doing so, cut their tongues on the grass, and since then their tongues have been forked. Vishnu is originally portrayed in the form sheltered by a Shesha naga or reclining on Shesha, but the iconography has been extended to other deities as well. 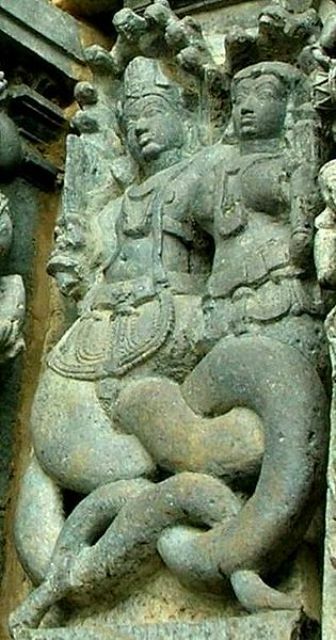 The serpent is a common feature in Ganesha iconography and appears in many forms: around the neck , use as a sacred thread (Sanskrit: yajñyopavīta) wrapped around the stomach as a belt, held in a hand, coiled at the ankles, or as a throne. 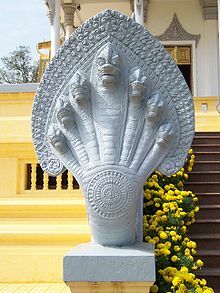 Shiva is often shown garlanded with a snake. Nagas are also snakes that may take human form. They tend to be very curious. Maehle (2007: p.?) affirms that according to tradition, Patañjali is held to be an incarnation of Ādi S’esha. Mucalinda sheltering Gautama Buddha; Wall-Painting from monastery in Laos. Traditions about nāgas are also very common in all the Buddhist countries of Asia. In many countries, the nāga concept has been merged with local traditions of great and wise serpents or dragons. In Tibet, the nāga was equated with the klu, wits that dwell in lakes or underground streams and guard treasure. In China, the nāga was equated with the lóng or Chinese dragon. The Buddhist nāga generally has the form of a great cobra-like snake, usually with a single head but sometimes with many. At least some of the nāgas are capable of using magic powers to transform themselves into a human semblance. In Buddhist painting, the nāga is sometimes portrayed as a human being with a snake or dragon extending over his head. 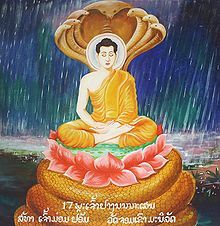 One nāga, in human form, attempted to become a monk; when telling it that such ordination was impossible, the Buddha told it how to ensure that it would be reborn a man, able to become a monk. Gigantic naga protecting Buddha amongst the other sculptures of Bunleua Sulilat‘s Sala Keoku. 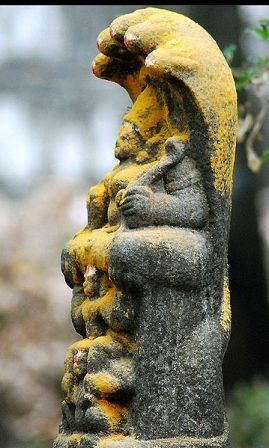 Nāgas are believed to both live on Mount Sumeru, among the other minor deities, and in various parts of the human-inhabited earth. Some of them are water-dwellers, living in streams or the mer; others are earth-dwellers, living in underground caverns. Some of them sleep on top of anthills. Their food includes frogs and they love milk. The nāgas are the servants of Virūpākṣa (Pāli: Virūpakkha), one of the Four Heavenly Kings who guards the western direction. They act as a guard upon Mount Sumeru, protecting the devas of Trāyastriṃśa from attack by the Asuras. Among the notable nāgas of Buddhist tradition is Mucalinda, protector of the Buddha. In the Vajrayana and Mahasiddha traditions according to Beer (1999),[page needed] many notable fully enlightened nagas also transmitted and/or transported terma into and out of the human realm that had been elementally encoded by adepts. Norbu (1999: p.?) 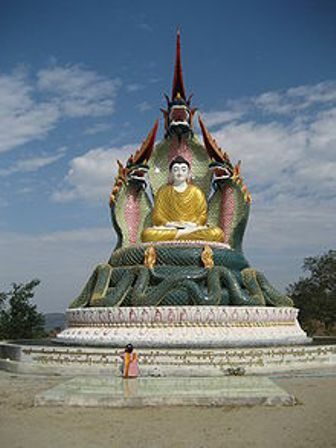 states that according to tradition the Prajnaparamita terma teachings are held to have been conferred upon Nagarjuna by Nagaraja, the King of the nagas, who had been guarding them at the bottom of a lake. Refer Lotus Sutra. 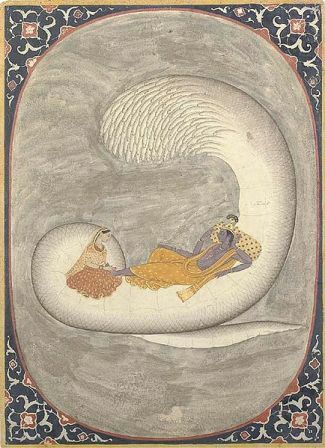 Ananta-Sesha, (“Limitless-Eternal”) the world serpent with a thousand heads serving as a bed of Vishnu. Padmavati, the Nāgī queen & companion of Dharanendra. Paravataksha, his sword causes earthquakes and his roar caused thunder. Takshaka, king of the Nāgas. Ulupi, a companion of Arjuna in the epic Mahabharata. Vasuki, king of the Nagas who helped the devas recover amrita from the Ocean of Milk. Patala (or Nagaloka), the seventh of the “nether” dimensions or realms, Bhoga-vatī being its capital. Lake Manosarowar, lake of the Great Nāgas. Kacha Naga/Duplicate Naga, the Naga tribes outside Nagaland. Naggar, village in the Himalayas, Tibet, that derives its name from Naga (Cobra). Nagpur, Indian city derived from Nāgapuram, literally “city of nāgas”. Sheshna’s well in Benares, India, said to be an entrance to Patala. Nagadaa, where naag-yaGYa was performed. Anantnag, Indian city (Kashmir) named after one of 12 prominent divine naga king mentioned in Bhavishyapuran. Takshila, an ancient place in Pakistan named after one of 12 prominent divine naga king in Bhavishyapuran. 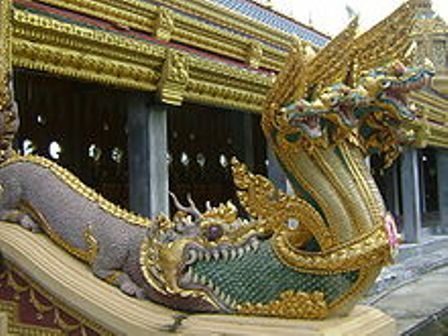 For Malay sailors, nāgas are a type of dragon with many heads; in Thailand and Java, the nāga is a wealthy underworld deity. 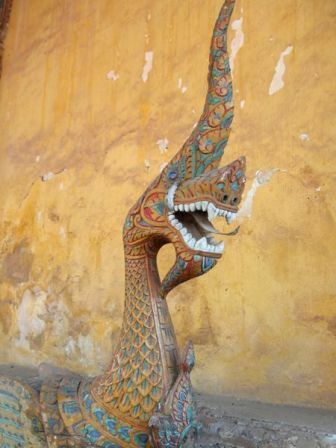 In Laos they are beaked water serpents. 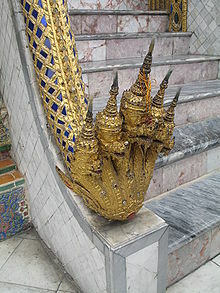 Phaya Naga, Water Dragon, is a well-known dragon in Thailand. People in Thailand see it as a holy creature and worship it in the temple. It allegedly lives in Mekong river. In a Cambodian legend, the nāga were a reptilian race of beings who possessed a large empire or kingdom in the Pacific Ocean region. See Kaliya. The Nāga King’s daughter married an Indian Brahmana named Kaundinya, and from their union sprang the Cambodian people. Therefore still Cambodians say that they are “Born from the Nāga”. The legend of the Nāga is a strong and sacred belief held by Thai and Lao people living along the Mekong River. Many pay their respects to the river because they believe the Nāga still rule in it, and locals hold an annual sacrifice for the Nāga. Each ceremony depends on how each village earns its living from the Mekong River — for instance, through fishing or transport. Local residents believe that the Nāga can protect them from danger, so they are likely to make a sacrifice to Nāga before taking a boat trip along the Mekong River. Also, every year on the night of 15th day of 11th month in the Lao lunar calendar at the end of Vassa, an unusual phenomenon occurs in the area of the Mekong River stretching over 20 kilometres between Pak-Ngeum and Phonephisai districts in Nong Khai province, Thailand. Fireballs appear to rise from the river into the nighttime sky. Local villagers believe that Nāga under Mekong River shoot the fireballs into the air to celebrate the end of Vassa, because Nāga meditate during this time. In 2000, Richard Freeman from the Centre for Fortean Zoology visited the area and talked with witnesses who claimed to have seen gigantic snakes far larger than any python. The general description was of a 60 foot serpent with black scales that had a greenish sheen. Freeman speculated that the nāga legend was based on a real animal, possibly a giant madtsoiid snake. ^ For the specific terminology for cobra see p. 432, Vaman Shivram Apte, The Student’s English-Sanskrit Dictionary (Motilal Banarsidass: 2002 reprint edition) ISBN 81-208-0299-3. ^ For the story of wrapping Vāsuki around the neck and Śeṣa around the belly and for the name in his sahasranama as Sarpagraiveyakāṅgādaḥ (“Who has a serpent around his neck”), which refers to this standard iconographic element, see: Krishan, Yuvraj (1999), Gaņeśa: Unravelling An Enigma, Delhi: Motilal Banarsidass Publishers, ISBN 81-208-1413-4 pp=51-52. ^ For text of a stone inscription dated 1470 identifying Ganesha’s sacred thread as the serpent Śeṣa, see: Martin-Dubost, p. 202. 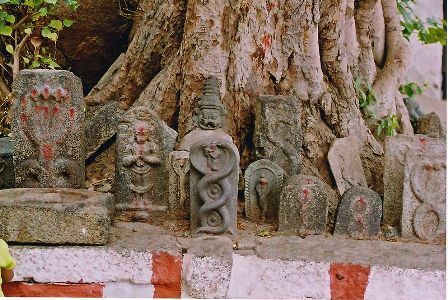 ^ For an overview of snake images in Ganesha iconography, see: Martin-Dubost, Paul (1997). Gaņeśa: The Enchanter of the Three Worlds. Mumbai: Project for Indian Cultural Studies. ISBN 81-900184-3-4. , p. 202. Claudia Müller-Ebeling, Claudia and Christian Rätsch and Surendra Bahadur Shahi (2002). Shamanism and Tantra in the Himalayas. Transl. by Annabel Lee. Rochester, Vt.: Inner Traditions. This article is about Druk, the Thunder Dragon. For other uses, see Druk (disambiguation). 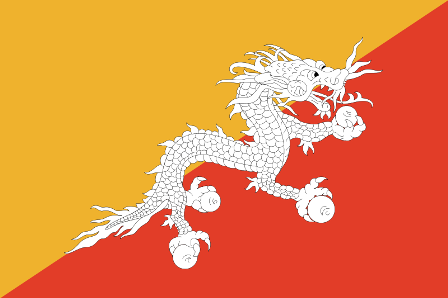 The Druk (Dzongkha: འབྲུག་) is the “Thunder Dragon” of Bhutanese mythology and a Bhutanese national symbol. A druk appears on the Bhutanese Flag, holding jewels to represent wealth. In the Dzongkha language, Bhutan is called Druk Yul, or Land of Druk, and Bhutanese leaders are called Druk Gyalpo, Dragon Kings – because of Druk. During the Bhutanese mock election in 2007, all four mock parties were called the Druk colour Party. The national anthem of Bhutan, Druk Tsendhen, translates into English as ‘The Kingdom of Druk’. ^ Every party had a separate colour representing its values. 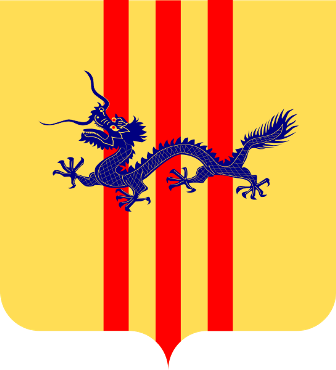 Coat of Arms of South Vietnam, 1955-1975. Vietnamese dragons (Vietnamese: rồng or long 龍) are symbolic creatures in the folklore and mythology of Vietnam. According to an ancient creation myth, the Vietnamese people are descended from a dragon and a fairy. The 5th-generation grandson of Shennong, Lạc Long Quân– king of the dragonkind living near the Đông sea, married a goddess, Âu Cơ who was the daughter of the birdkind king Đế Lai. Âu Cơ bore 100 eggs, which hatched into 100 sons. The first-born son became the king of Lạc Việt, the first dynasty of Vietnam, and proclaimed himself Emperor Hùng Vương. The First was followed by Hùng Vương The Second, Hùng Vương The Third and so on, through 18 reigns. This is the origin of the Vietnamese proverb: “Con Rồng, cháu Tiên” (“Children of Dragon, Grandchildren of Gods”). The Vietnamese dragon is the combined image of crocodile, snake, lizard and bird. Historically, the Vietnamese people lived near rivers, so they venerated crocodiles as “Giao Long”, the first kind of Vietnamese dragon. There are some kinds of dragons found on archaeological objects. One group is that of the crocodile-dragons, with the head of a crocodile and the body of a snake. The cat-dragon excavated on a glazed terracotta piece in Bac Ninh has some features of Đại Việt period dragon: it does not have a crocodile head, its head is shorter and it has a long neck, its wing and backfin are long lines, and its whiskers and fur are found in the Đại Việt dragon image. On the brick from this period found in Co Loa, the dragon is short, with a cat-like body and a fish’s backfin. The Lý Dynasty is the dynasty which laid the foundation of Vietnamese feudal culture. Buddhism was widespread and Van Mieu, the first feudal university, was opened. The slender, flowing dragon of this period represents the King, and is literature dragon. These dragons’ perfectly rounded bodies curve lithely, in a long sinuous shape, tapering gradually to the tail. The body has 12 sections, symbolising 12 months in the year. On the dragon’s back are small, uninterrupted, regular fins. The head, held high, is in proportion with the body, and has a long mane, beard, prominent eyes, crest on nose (pointing forwards), but no horns. The legs are small and thin, and usually 3-toed. The jaw is opened wide, with a long, thin tongue; the dragons always keep a châu (gem/jewel) in their mouths (a symbol of humanity, nobility and knowledge). These dragons are able to change the weather, and are responsible for crops. The Trần Dynasty dragon was similar to that of the Ly dynasty but looked more intrepid. The Tran dragon has new details: arms and horns. Its fiery crest is shorter. Its slightly curved body is fat and smaller toward the tail. There are many kinds of tail (straight and pointed tail, spiral tail) as well as many kinds of scale (a regular half-flower scale, slightly curved scale). 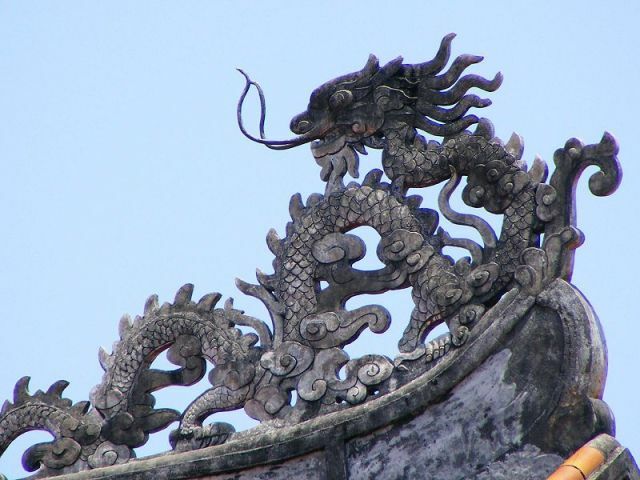 The Tran dragon symbolised the martial arts, because the Tran kings were descended from a Mandarin commander. The Vietnamese had to fight Mongol invaders in this age. In this period, the Vietnamese dragon’s image was influenced by the Chinese dragon, because of Confucianism‘s expansion policy. Differing from those of the previous dynasty, dragons in this age are not only represented in a curved posture among clouds but also in others. These dragons were majestic, with lion-heads. Instead of a fiery crest, they have a large nose. Their bodies only curve in two sections. Their feet have five sharp claws. 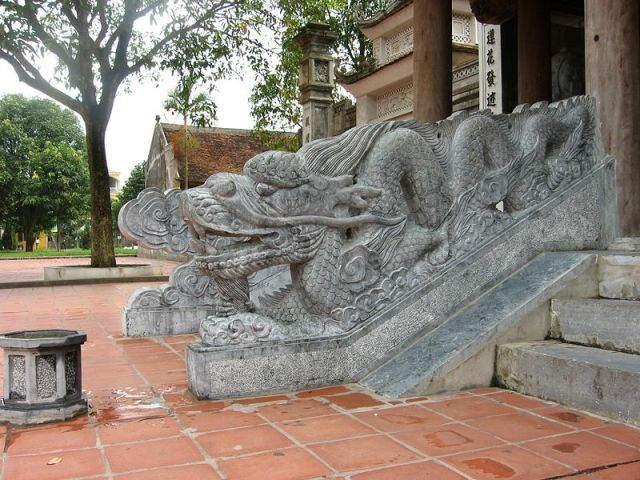 (1802–1883) During the early part of the Nguyễn Dynasty, the dragon is represented with a spiral tail and a long fiery sword-fin. Dragons were personified by a mother with her children or a pair of dragons. Its head and eyes are large. It has stag horns, a lion’s nose, exposed canine teeth, regular flash scale, curved whiskers. Images of the Dragon King have 5 claws, while images of lesser dragons have only 4 claws. (1883–1945) In this later period, the dragon image degenerated and became unrefined, losing its natural and majestic shape, and was seen as a signal of the decline in art of the last Vietnamese dynasty. “Rồng gặp mây”: “Dragon meets clouds” – In favourable condition. “Đầu rồng đuôi tôm”: “Dragon’s head, shrimp’s tail” – Good at first and bad at last; something which starts well but ends badly. “Rồng bay, phượng múa”: “Dragon flight, phoenix dance” – Used to praise the calligraphy of someone who writes Chinese ideograms well. “Rồng đến nhà tôm”: “Dragon visits shrimp’s house” – A saying used by a host to (or of) his guest: the host portrays himself as a humble shrimp and his guest as a noble dragon. “Ăn như rồng cuốn, nói như rồng leo, làm như mèo mửa”: “Eating as dragon scrolls, talking as dragon climbs, working as cat vomits” – A criticism of someone who eats too much and talks a lot, but is lazy. Many place-names in Vietnam incorporate the word Long, or Rồng (also meaning dragon): Ha Long Bay (vịnh Hạ Long), the section of the Mekong river flowing through Vietnam contains 9 branches and is called Cửu Long (meaning nine dragons); Hàm Rồng bridge, Long Biên bridge. Other things named after dragons include: Thanh Long (dragonfruit), vòi rồng (waterspout), xương rồng (Cactaceae), long nhãn (dragon eyes: Vietnamese cognate word for longan fruit). Korean dragons are legendary creatures in Korean mythology and folklore. 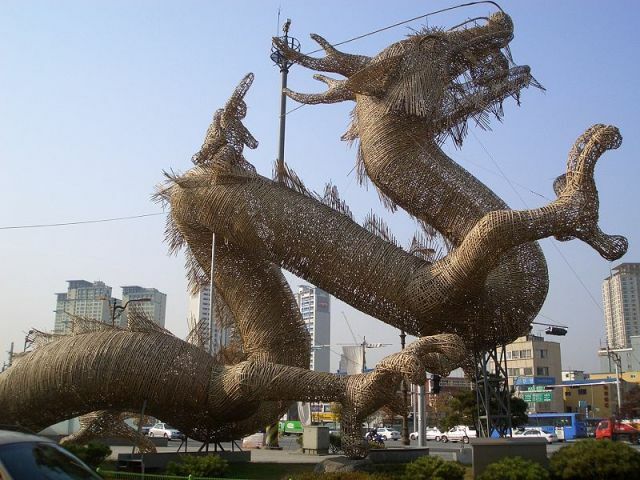 Although generally comparable with Chinese dragons in appearance and symbolic significance, Korean dragons have unique culture-specific properties that differentiate them from dragons in other cultures. Whereas most dragons in European mythology are generally related to the elements of fire and destruction, dragons in Korean mythology are mostly viewed as benevolent beings related to water and agriculture, often considered bringers of rain and clouds. Hence, many Korean dragons are said to have resided in rivers, lakes, oceans, or even deep ponds within mountains. The symbol of the dragon has been used extensively, both in Korean mythology and ancient Korean art. Ancient texts sometimes mention sentient speaking dragons, capable of understanding such complex emotions such as devotion, kindness, and gratitude. One particular Korean legend speaks of the great King Munmu, who on his deathbed wished to become a “Dragon of the East Sea in order to protect Korea”. The Korean dragon was said to have certain specific traits, generally like the Chinese dragon, but it developed a longer beard. It is in many ways very similar in appearance to dragons of Chinese and Japanese mythology. Very occasionally a dragon may be depicted as carrying a dragon orb known as the Yeouiju (여의주) in one or more of its claws. Modeled after the mythical Cintamani jewel or pearl, it was said that whoever could wield the Yeouiju was blessed with the abilities of omnipotence and creation at will, and that only four-toed dragons (who had thumbs with which to hold the orbs) were both wise and powerful enough to wield these orbs, as opposed to the lesser, three-toed dragons. As with China, the number nine is significant and auspicious in Korea, and dragons were said to have 81 (9×9) scales on their backs, representing yang essence. Korean folk mythology states that most dragons were originally Imugis, or lesser dragons, which were said to resemble gigantic serpents. It was thought that an Imugi could become a true dragon, or yong/mireu, if it caught a Yeouiju which had fallen from heaven. The Korean cockatrice is known as a gye-ryong (계룡/鷄龍), which literally means chicken-dragon; they do not appear as often as dragons. They are sometimes seen as chariot-pulling beasts for important legendary figures or for the parents of legendary heroes. One such legend involves the founding of the Kingdom of Silla, whose princess was said to have been born from a cockatrice egg. Bates, Roy, All About Chinese Dragons, China History Press, 2007.
by the seal of the president of the United States. outfit; she’s armed and dangerous. Miss France – Eiffel Tower? Check. Beret? Check. have really, really strong neck muscles. at Mardi Gras, not Miss Universe. and tennis shoes err … heels.